It is not as hard as you think! This is my favorite recipe for Honey White Wheat Bread and a step-by-step guide to making your first, hot from the oven, loaf of homemade bread. There is nothing like the smell of yeast rising or the fresh baked smell of a loaf of homemade bread cooling in the kitchen. 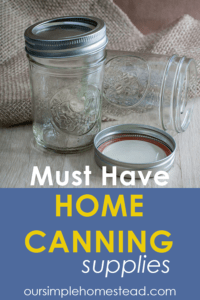 The wonderful smell can take you back to your grandmother’s kitchen or your favorite bakery, but whatever puts a smile on your face, put on your apron and come into my kitchen while I show you how to make homemade bread. 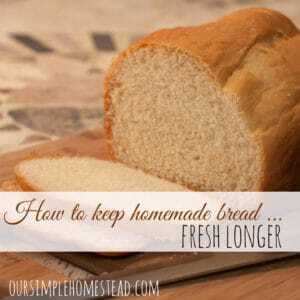 A basic simple homemade bread recipe. 1. In a large bowl, dissolve yeast in warm water. In a separate bowl add 2 cups of wheat flour, salt, honey and oil. Add yeast mixture and beat until smooth. 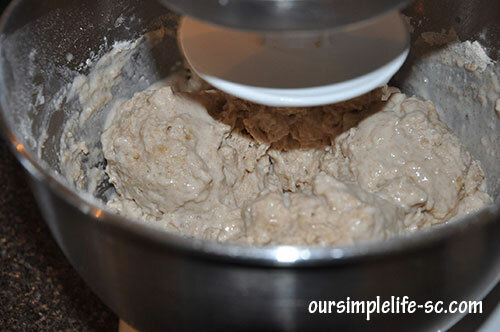 Stir in enough remaining bread flour, alternating with milk to form a soft dough. 2. 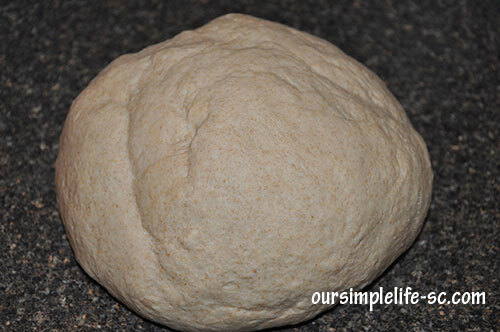 Turn onto a floured surface; knead until smooth and elastic, about 8-10 minutes. Place in a oiled bowl, turning once to oil the top. Cover and let rise in a warm place until doubled. 3. Punch dough down. 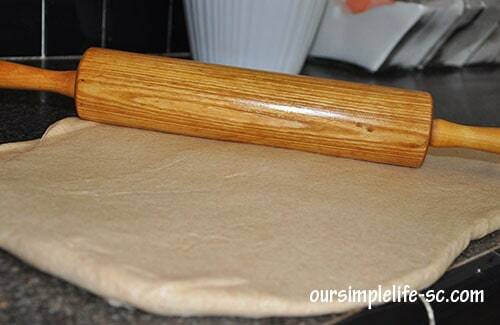 Turn onto a lightly floured surface; roll out with rolling pin and roll out any air bubbles, divide dough in half. Shape each into a loaf. Place in two greased 9-in. x 5-in. loaf pans. Cover and let rise until doubled. 4. Bake at 350° for 30-35 minutes or until golden brown and bread sounds hollow when tapped. Remove from pans to wire racks to cool. 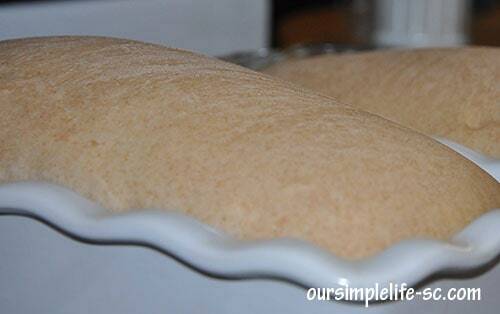 Step #1 – In a measuring cup measure 1/2 cup warm water and add the 2 1/2 teaspoons of dry yeast. Let this mixture sit for 5 minutes. Learning to read yeast will come easily once you know what you are looking for. 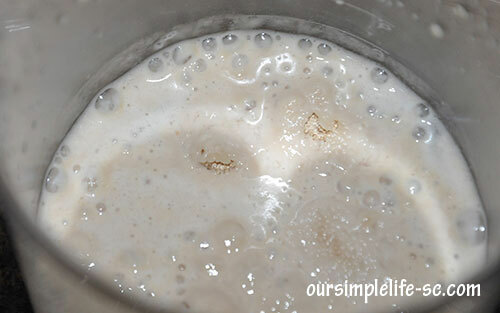 The yeast is ready if you start seeing it foam and form bubbles around your measuring cup. If you do not have a thermometer to check the temperature you can sprinkle a few drops on your wrist, much like you would check a baby bottle if a baby could drink its perfect. If your water is too hot it will kill the yeast and your bread will not rise, and if it’s too cold it will not proof. Step #3 – With your fingertips, lightly oil a measuring cup and then measure out 1/3 cup of honey. The oil will coat the cup and the honey will slide right out. 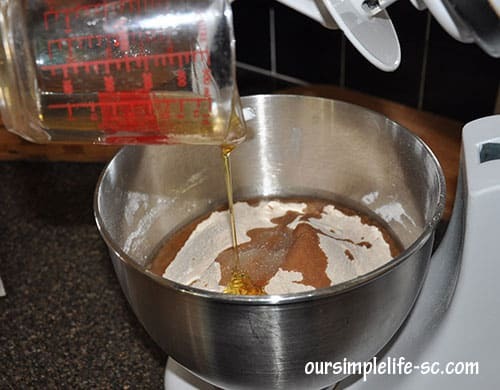 Add the honey and the 2 1/2 tablespoons of oil to the flour and salt mixture. 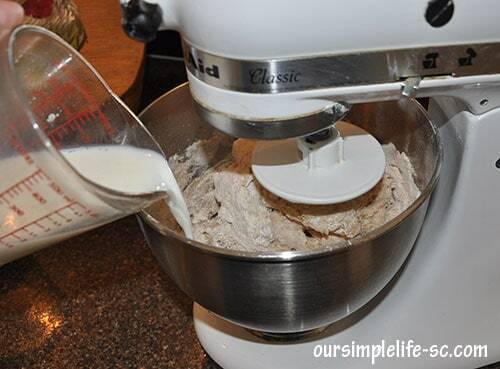 Step #4 – I use my KitchenAid Stand Mixer, with the bread hook attached for this step, but you can use a big wooden spoon and a large bowl. 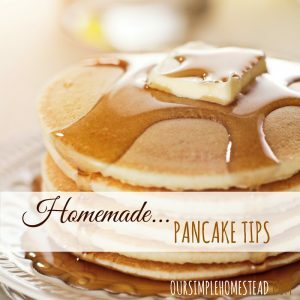 Blend the milk with the flour, salt, oil, and honey and then add the yeast. Step #5 – The mixture will be wet, but at this stage, it is important everything gets mixed well before you start incorporating the rest of the flour. 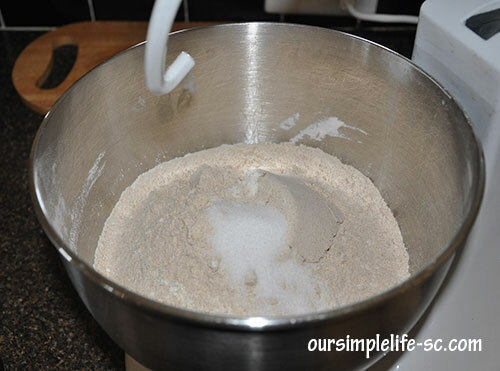 Step #6 – Once everything is mixed slowly add more of the reserved 1/2 to 1 cup of flour. Stop every few seconds to clean off the side of the bowl to be sure all is mixed. Slowly add the reserved flour a little at a time. 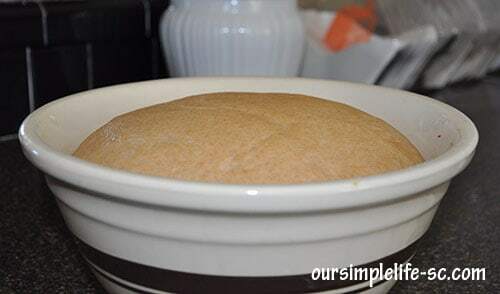 You will know you have added enough flour when it’s not sticking to the side of the bowl, and it starts to form a ball. If you add too much flour your bread will be dry, not enough and your dough will be too sticky to knead. So again, look for it to come off the side of the bowl and form a ball that can be easily lifted out of the bowl. This step usually takes about 2 – 3 minutes of mixing. Step #7 – With the remaining flour coat your counter and remove the dough from the bowl. A nicely formed ball that is not too sticky or too dry. You want it to feel slightly tacky. 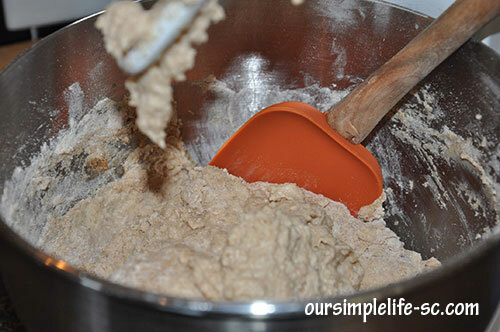 Step #8 – With the heel of your hands knead the dough for a remaining 5 – 6 minutes. To knead the dough, you will want to push it down and out, flattening it in front of you. This process helps stretch the gluten strands in the dough. Fold the top half of the dough back towards you, and press down again with the heel of your hands. 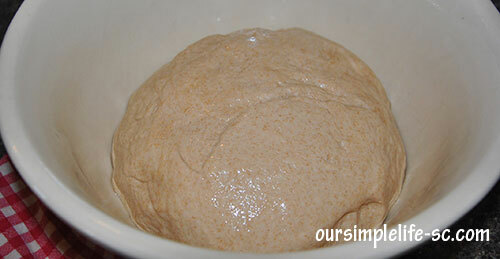 Step #9 – You will know your dough is ready when it is smooth and holds its shape. You can also test it by poking it, if the indentation fills back quickly, you’re good to go. Step #10 – Oil a large bowl and place the dough in the bowl and then flip it over so the oiled side of the dough is upright. 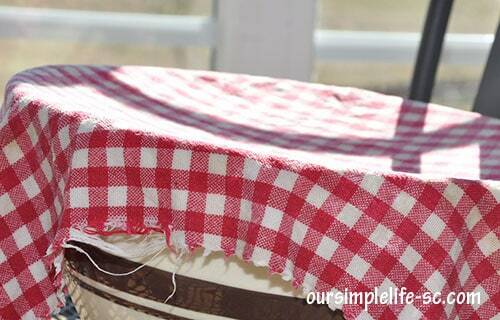 Cover with a dish towel or plastic wrap. 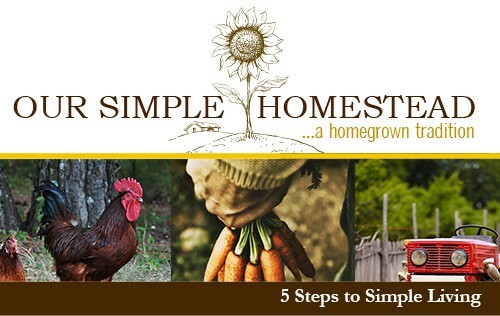 Step #11 – Find the warmest or sunniest spot in your home. This could be a sunny window, warm stove top or even a spot close by a woodstove or fireplace. Step #12 – Depending on the warmth of your home, the first rising process can take anywhere from 2 – 4 hours. You will know your dough has risen enough when it has doubled in size. With a balled fist, gently punch a hole in the center of the dough and remove it from the bowl and place on the counter. Cover with a towel and let sit for 5 minutes to rest. 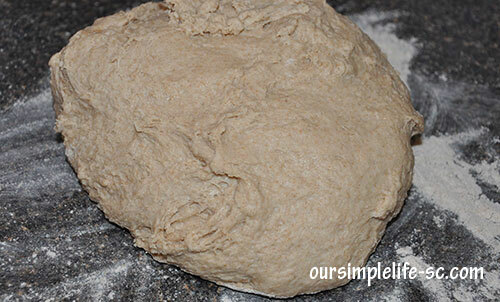 Step #13 – Once the dough has rested, roll the dough into a rectangle and then roll the dough into the shape of a log. Step #14 – With a knife cut the dough into two equal pieces and shape to fit into a two 9 inch greased bread pans. 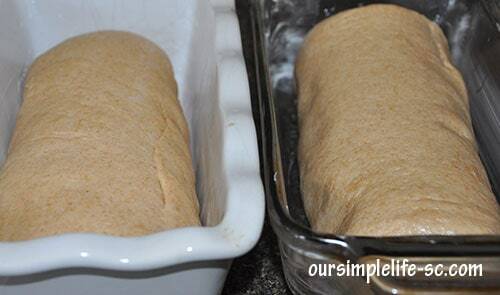 Step #15 – Find your houses warm spot again and let your dough loafs rest and rise again until they have doubled in size. 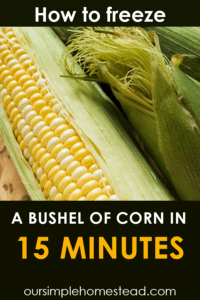 This rise normally takes 1 – 2 hours depending on the warmth of your home. Once they have risen place them in a pre-heated 350-degree oven and bake for 30 – 35 minutes. 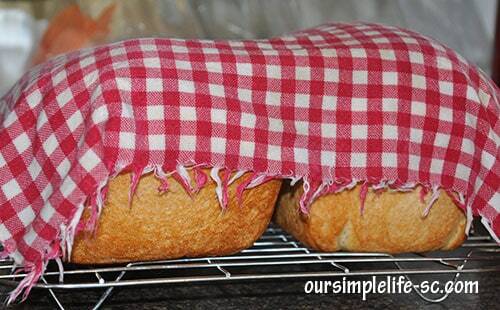 Step #16 – Cool baked bread on a rack and cover with a damp towel to prevent the crust from getting too hard. I bet you can smell it now...the aroma of freshly baked bread smothered with butter and homemade jams. Just waiting for you to sit down and enjoy the first piece. This looks so yummy! I plan to try this sometime in the near future! 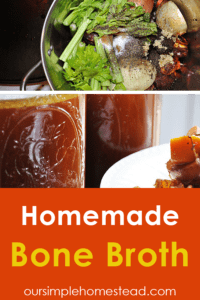 It is one of my favorite recipes…so enjoy! 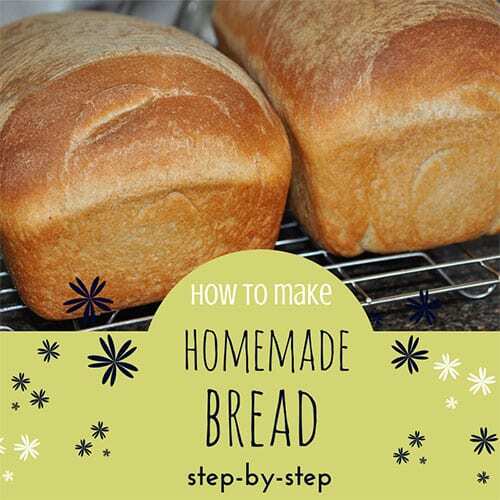 Tracy, what a wonderful step-by-step to make this beautiful bread! 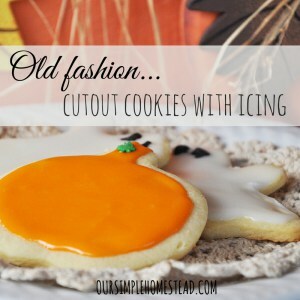 Thank you so much for sharing at Best of the Weekend – pinning! Hope you have a happy Tuesday and a wonderful week! Oh I can smell it now. It looks wonderful. There is nothing better than fresh baked bread. This is a great tutorial. Thanks for sharing with us at The HomeAcre Hop! That’s GREAT! Thank you so much and I so enjoy your weekly blog hop! 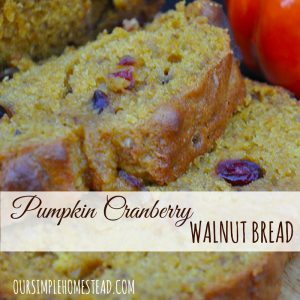 Thanks Ann…baking breadis one of my favorite weekly chores and I am glad to share i with everyone. 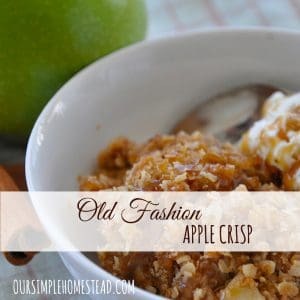 Thanks for linking up at From the Farm Blog Hop! This was chosen as one of this week’s favorites! Hope to see you again this week! Thank you Heather that is great! I so enjoy the Farm Blog Hop! I love to make bread but lately it’s turned into a love/hate thing. My dough looks and feels beautiful. It comes out of the oven looking delicious and brown. Then I cut into it and it’s not completely done in the middle. I’ve extended the baking time but am afraid of over baking. Is there any way to check the internal temperature to make sure it really is done? The first thing I would do is check your oven’s thermostat. If you are cooking your bread at 350 for 30 minutes and it is still not done in the middle I would be checking the oven temperature. If you think your oven is working good then most breads are finished baking at about 190° which you could check with a thermometer. Do you every freeze your bread? I want to start making my own bread but feel at this point I do not have enough time to make bread every couple of days. Yes I do and I will tell you the secret to freezing bread. I make up the dough and let it raise for the first time. Once I have punched it down and rolled it out into loaves and placed it into my prepared loaf pans, I let one loaf raise to bake that day and then the other one I put the pan and all into a large ziplock bag and place it in the freezer. On the day I need to bake another loaf of bread I take it out of the freezer, remove the bag, and let it raise. Since it is frozen it take a good part of the day to raise, but it is fresh and hot by supper time.